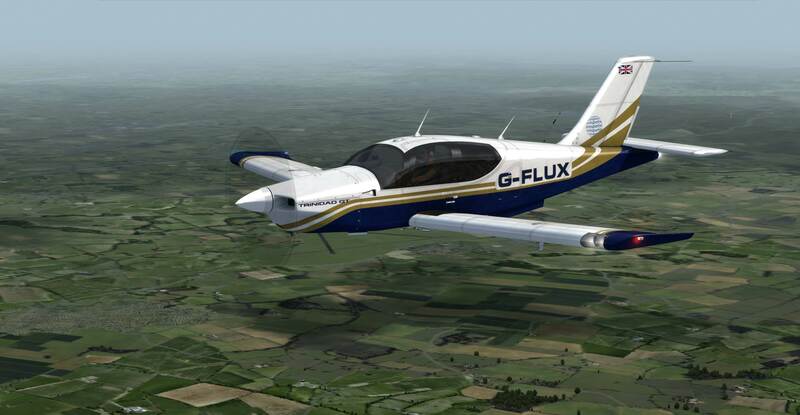 The Exteriors feature a 4K resolution (4096 x 4096 pixel) Fuselage texture, super resolution polygon modelling, flush side window plexiglass, retracting foot step pylons, high detail landing gear featuring Ambient Occlusion shading. 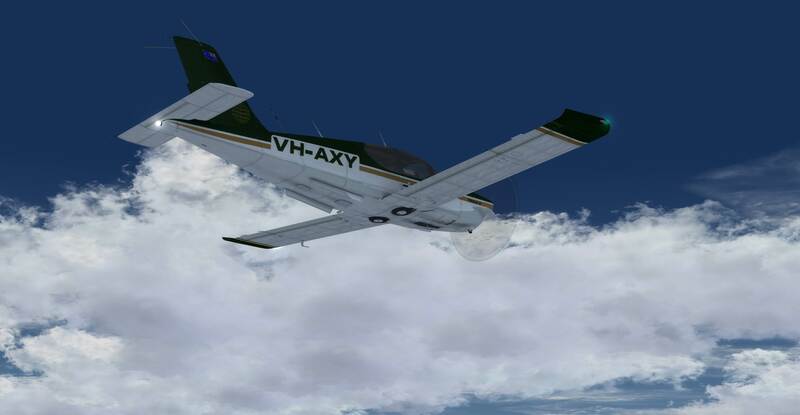 There are 22 various paint schemes for external liveries, ranging from France and England, to Canada and America, to Australia and even 2 Military variants. One British and one Australian set of variants feature very weathered, faded, bug spattered, muddied up versions that are showing their wear for their age. This package features 5 different versions of interiors. Gray standard, Lite Tan, rich brown, rare blue suede, and dirtied up gray. A couple of the tan interiors might have gray instrument pods, as this is how some real world Trinidad's are laid out. If you are knowledgeable in moving around textures, you can change the color of an interior by trading out the color sheets to a planes texture folder, changing it from gray to brown, etc. The interiors are jam packed with tiny details, knobs and levers. The arm rests swivel up out of the way of the fuel selector and rudder trim. The control yokes can be hidden away by clicking the white under-panel-pull-handle. The instrumentation features standard (mostly) Trinidad equipment. We tried to make them as standard as possible, though many Trinidads show a lot of customization in this department. We fitted our model with a GPS500, GNS430, and a COM2 NAV2 unit. The grain of the leather is clearly seen in the high resolution textures as well as lite scuffing and wear, little scratches on the instrument panel faces, etc. 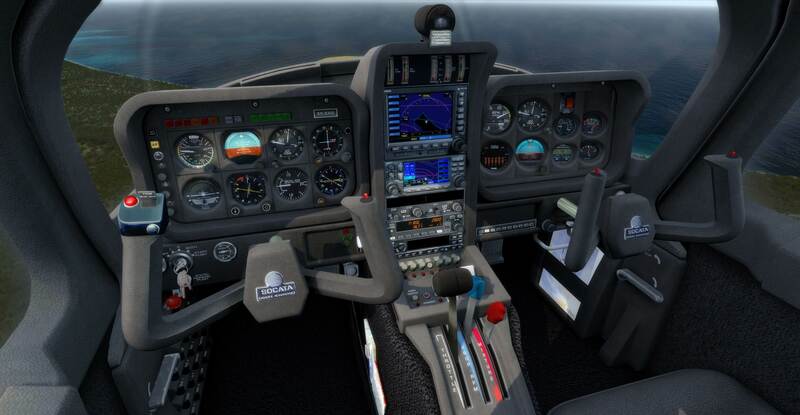 The Trinidad features glass covered instruments but we found that with FSX users, they could not get mouse-over data from the instruments, so we made the glass able to be hid by the click of the glass face, or the small knob in the top right of the pilots instrument pod. Due to moderate negative input from customers about reflections and tinting, we used almost zero reflections (only on the front, but barely visible) and soft shading/dusting on the windows edges. Otherwise, the glass (inside) is very clean and tint free. Only the outside is dark tinted on the nicer aircraft fleet. The dirtied up aircraft feature very low tinting and they are a bit dirty as well, (outside only). Group of two couples, front and rear. The weight loadouts of the 4 versions of aircraft are already adjusted so you do not need to adjust the loads themselves. This is achieved with separate aircraft folders. We also were able to link the aircraft to the core Trinidad texture system so that 'added textures' were not necessary, keeping the Trinidad footprint low on your hard drive, (lower then it might have been with multiple copies of texture sets through 3 sets of Trinidad variants). A cool feature with the plane is that the people are high detailed, so you actually see the passengers in the heavy loadouts. The passengers are 'not' in the interior VC model, only in the exterior models. 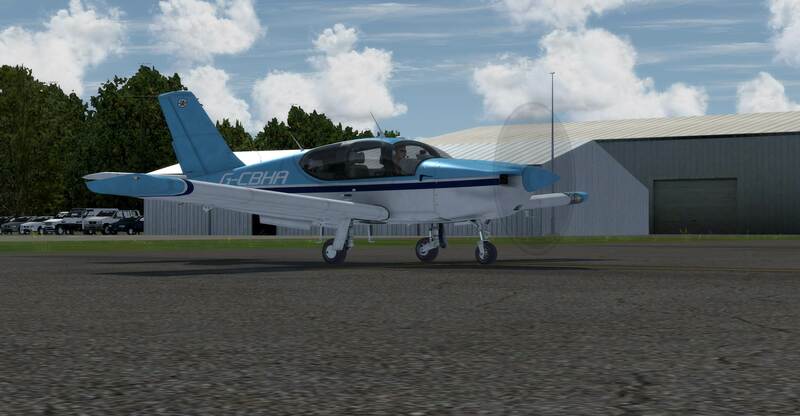 If you are familiar with how to move variants of plane models around on the aircraft configs, you can add a female pilot to your favorite paint scheme, or add a group passenger layout to a preferred liverie. The Trinidad Pilots Manual is located in the aircraft. You can either use Shift-6 to access the manual 'in-cabin' or you can access the PDF file in the Trinidad's main folder in the Sim/Sim Objects/Airplanes/LHC_Trinidad_TB21GT/Manual folder. Having the manual available 'in' the plane is pretty handy, but you can also print off the PDF if you like as well to study it when away from the computer. The manual is 'not' super detailed like an actual manual. 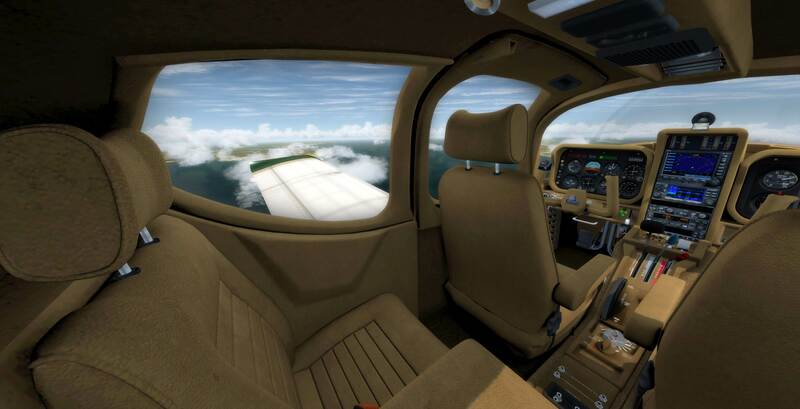 Only the basics are covered concerning flying this aircraft in Flight Simulator. The manual pages are flipped via clicking on the bottom corners of the pages, left and right sides. Clicking in the middle should make the manual disappear back to its storage cubby by the front passengers right leg. 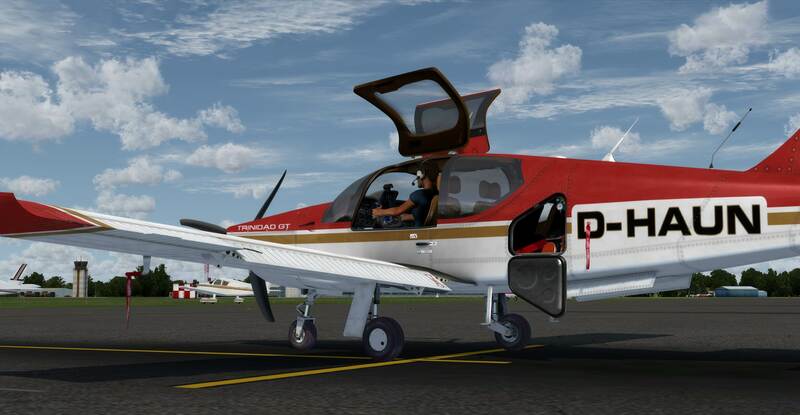 Update: If you purchased the Lionheart Creations "Trinidad TB21 GT2" from PC Aviator prior to March 8, 2018, you will receive an e-mail with your unique activation code needed to update your product. Please ensure you are receiving PC Aviator e-mails by subscribing to our newsletter.